← 1 Adam 12, 1 Adam 12, We Have a MUNI Fail Whale In Progress! Reminder: Gerry Adams Comes to the Inner Sunset on Saturday! Just a quick reminder that Gerry Adams, the president of Sinn Fein, will be the host of a forum entitled “A United Ireland – How Do We Get There?” at St. Anne’s Hall over at Funston and Judah (right on the N line). It runs from 2pm-5pm, and Mr. Adams and a panel of Irish and Irish Americans will be there to answer any questions the public may have about the situation in Ireland. It’s not often we get international leaders right here in our neighborhood, so if you’re interested, check it out. Figure it this way – you’re far more likely to get a question about Ireland’s future answered by Mr. Adams and the panel than you are from local officials about the future of the N Judah! 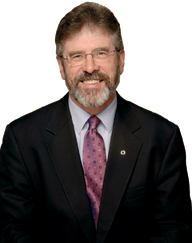 One Response to Reminder: Gerry Adams Comes to the Inner Sunset on Saturday!